Mercury Waste Solutions has two comprehensive programs for relamp and retrofit service providers. These nationwide programs meet your volume and service requirements for fast removal and recycling of fluorescent lamps. These programs provide increased efficiency for both small and very large jobs. A nationwide bulk fluorescent lamp recycling service program that meets your high volume re-lamp and retrofit requirements for timely removal and processing of lamps. 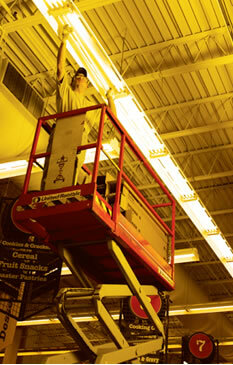 It's ideal for larger re-lamping jobs that require multiple pallets of bulbs to be recycled. BulkLampTracker is designed to help you manage your lighting re-lamp projects more efficiently to get you in and out of your job sites in the shortest time possible. Eliminates transportation scheduling, while providing the required documentation using our on-line tracking and reporting system. Includes recycling, transportation, tracking, compliance and service. * When all program requirements are met. A complete turnkey solution to collect, store, handle ship and recycle fluorescent lamps, lamp ballasts, batteries, dental amalgam and separator filters, mercury switches, CRTs, electronics, and other mercury-containing devices. Program includes container shipping both ways, recycling of all products, and emailed certificate of recycling and on-line recordkeeping of all containers ordered, recycled and outstanding. No transportation scheduling; simply order, fill and set out for UPS or FedEx pickup. Containers are available in various sizes and capacities for all types of mercury-containing products.